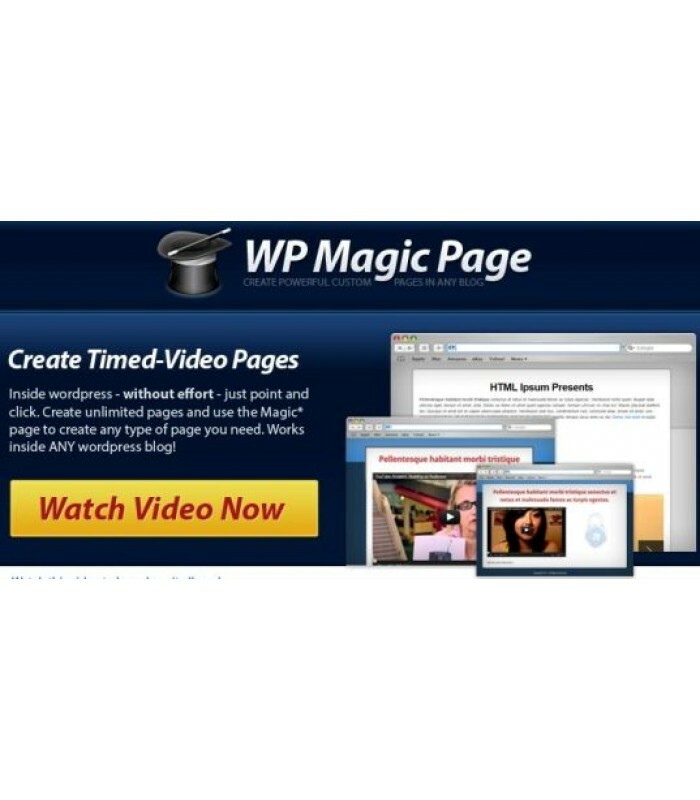 Use WP Magic Page to create your marketing pages with ease. Install it once and you can create unlimited pages. Create powerful timed video pages that will wait a set time and display a buy-now button. A super effective sales tactic. As used by this industries top professionals! Works in WordPress – Runs perfectly in any wordpress installation. Just upload like any other wordpress plugin, select activate and you will be able to create unlimited pages using all different styles. One Click Install – Click activate and everything is ready to go. Use on any blog including blogs with full content. All pages will not effect any other page on your blog. Works independently and easily. Timed-Video Pages – Create two (2) different types of Timed Video pages, add your own video and buy now button that will display on a timer that you set. It’s that easy. Just set it up and it will animate with the timer. Fully Cusomizable – Choose the background style, content and edit anything with ease and without effort. Creating Timed Video pages is incredibly easy and use Content Page Builder to create elaborate pages. Content Page Builder – Create any type of page, squeeze, sales or even download pages using the Magic Page builder, which generates all kinds of helpful HTML snippets for your page. Just copy and paste. Create Unlimited Pages – With the power of wordpress you can unlimited timed video pages, and even unlimited content magic pages to build a complete sales flow, website and much more. It’s really so simple. Add Column Blocks – Use the WP Magic Page builder to generate blocks of content to build your page with. Add 3 column, 2 column blocks with sidebar either on left or right side. Build any type of page. Add Tabbed Content – Add a tabbed content block to your page, write the tab name as well as the content for each block. Add a smooth tabbed content block to your pages using the simple code generator wizard. Add Image Slider – Add a smooth and sleek image slider to your page in only seconds. Just add up-to six (6) images and place it anywhere on your page. Showcase any images with style and ease on your pages. And Much More – Use the WP Magic Page to build awesome Timed-Video Pages or elaborate Content Pages and anything in between. Create long-form salesletters or quick About us Pages for your company. Create timed-video pages in large and small styles, as well as Magic Pages which have wizards to output Tabbed Content, Image Slider, Columns and more! It couldn’t be simpler – create unlimited custom pages, including the powerful Timed-Video pages.